Nobody likes cold weather, not even your cars. Car doors freeze up and lock you out of your car as they take a stand against the freezing cold. Many people have had this experience and it’s not funny. So, in this article, I will offer a few solutions on how to manage frozen car door locks. How do you thaw a frozen lock? Will rubbing alcohol unfreeze car doors? Getting into your car when the lock is frozen requires a bit of ingenuity. People have successfully come up with different ideas on how you can unfreeze the ice on your locks and get into your car. Most of the items add ideas that can help you get into your vehicle are easily available or found at home. 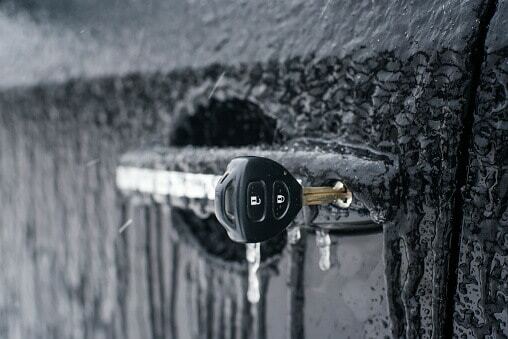 Listed are some of the solutions you can use to unfreeze your car locks. Alcohol freezes at a lower temperature than water. Hand sanitizers are alcohol-based and can easily thaw out the ice in your lock to grant access into the car. Apply or dip your car key into the sanitizer. Then, insert it gently into the lock and let it stay for about a minute. The alcohol will melt the ice and you can now easily turn the car and open the lock. When using hand sanitizer to thaw the ice on your locks, unsuccessful attempts should not be followed by the use of a lighter since alcohol is highly flammable and may lead to a fire. Thawing with a de-icing spray is an easier and faster method of cutting through the ice and gaining access into your car. A de-icing spray is a chemical that melts ice faster. It enables you easy access into your car in less than 5 minutes! Make sure you have it stored in a place that you can easily access it for those days that you need it. Using a BIC lighter, heat your key for about 10 seconds. Then, Insert it into the lock gently since hot metal can bend out of shape under pressure. Let it stay in the lock for approximately one minute to completely heat and melt up the ice in the lock and then gently open your door and gain access to your car where you can warm up. Petroleum jelly is a good lubricant. Coat your key with jelly and insert it into your lock. Let it work the kinks of the locks and turn gently to open. If you have a blow dryer, you can use it to melt the ice frozen around your locks. This can happen if you have an electrical outlet that is near the car for instance in the garage or on the outer part of your house. You can fix your blow-dryer in this outlet and blow onto the car locks. New cars can be easily remote started. As it heats up, it melts the ice on the body and in your locks. This lets you gain access to your car. You can come up with innovative ways which you can use your body heat to melt the ice in your locks. Your breath is always warm, if it isn’t you can always take in something hot, like coffee to help you generate heat internally. You can also use your palms. By placing it on the lock, heat from your hands could effectively melt the ice on your locks allowing you access to your car. Listed are some of the ways you can rely on to ensure that your car door doesn’t freeze shut during winter. Lubricate your locks regularly to ensure they don’t freeze up. You can apply petroleum jelly with your keys, spray a lubricant or dip cooking oil into the locks. This prevents corrosion as well as the buildup of water, which later freezes in the locks. Get a magnet that can easily fit around the lock of your car door and use it to cover the locks. This will prevent the entry of cold air and water. You won’t have to use cooking oil or petroleum jelly to prevent accumulation of moisture. Worn gaskets store water that then turns to ice when it snows. This ice then freezes the door in causing it to lock you out. Ensure that you inspect your gaskets and keep them in good condition. When they are old and worn out, it’s easier to buy new ones than leaving them in until the day you get stuck outside your car in winter. A car cover is one of the essential car equipment that you should have. Use it every time you park your vehicle, whether in winter or summer. It’s important to protect your car from the vagaries of the weather. Your car is adversely affected by reactions with environmental elements such as the sun or cold weather. When you cover your car during winter, it is unlikely that your doors will freeze shut. Ice will collect on the cover and not the car. Alcohol freezes at lower temperatures than water. You can actually use it to prevent ice from locking you out of your vehicle. When you rub alcohol on and in the lock of your car, any ice or water that gets into the lock won’t freeze. Regularly dab the lock with alcohol during the winter season. This will prevent your locks from freezing and causing the inconvenience of being locked out. Ensure that you always park in a garage. Parking in a garage will ensure that your car is not exposed to ice. Your locks are well protected from freezing and your car is not likely to shut you out when you are in a rush to work in the morning. Gaskets help in the locking mechanism of your door. Coat them with lubricant during winter and your car won’t freeze shut. You can use petroleum jelly, WD-40 or even cooking oil for this purpose. Covering your lock with duct tape to helps to keep it dry and protected from ice and water that can freeze shut the car door. Use it sparingly as it may cause harm to your car’s paint works. Dirty doorframes cause the door to lock poorly. They leave a small space in which water can seep into the car door and the result is a frozen shut car door. A little water and a microfiber towel are basically all you need to clean the door frames. Applying alcohol is one of the most popular solutions to unfreezing car doors. There are different forms of alcohol that are readily available and used to thaw ice from your car door. Hand sanitizer is one of the most prominent alcohol examples that ‘s always in your home. Plus, it does a good job in unfreezing car door locks. Alcohol does not freeze at the same rate as water. In addition, is very soluble. These two features make it the best substance to thaw your doors. When you douse alcohol on your car key, for example from a hand sanitizer and push it through the locks, it melts the ice. In addition, it mixes with the water, which then flows out of the lock. Why does this happen? Because it can’t freeze at the prevailing temperatures due to the alcohol present. Many experts recommend spraying the locks with a de-icing spray whenever your car door freezes and has you locked out. De-icing sprays are convenient and do not have to be bought. They’re easily made at home courtesy of YouTube. This enables you to thaw the ice freezing your car doors quickly and get you away from the cold and into the warm insides of your car. You will need a spray bottle, enough isopropyl alcohol and a cup of water. Mix the alcohol into the water then put it into the spray bottle. In a few minutes, your de-icing spray is ready. At the door of your car, spray it directly into the frozen lock or on the frames. The alcohol melts the ice and in a few minutes, your homemade solution allows you to board your car and go to work. You can easily spray hot tea or coffee into the locks. Ensure that either liquid has no particles. Using a spray bottle, spray the hot coffee or tea into the locks of your car locks and the frame where the ice could have frozen to shut your car door. It will melt the ice in your locks and flow it out, as it is hot. It will also melt the ice on your doorframes. Please wipe your frames after using coffee or tea as it may also freeze over if left on the frame for a long while. Hose sprayed water can also be used as a frozen car door spray. First, it’s delivered in a lot of pressure that’s able to break down the ice particles frozen in the locks or on the frames of the car door. Secondly, it is much warmer than the frozen water or ice that is shutting the doors. This significant temperature difference results in the thawing of ice and gaining access to your car. This is another form of frozen car door spray. Cooking spray acts as a lubricant that prevents ice from forming in the car locks or on the doorframes. Cooking spray is a thick and viscous substance. When coated onto the gaskets it prevents the accumulation of moisture. Accumulated moisture under cold weather always turns into ice. On the locks, it prevents ice from collecting. Consequently, your locks are clear of ice enabling smooth access to your car even in winter while others have to contend with different ice thawing methods. Cooking spray is very slimy and could leave an unsightly blot on your car. Using a dry cloth, wipe it away gently. Mix dishwashing soap with water and rubbing alcohol. This is another way to make a homemade de-icer. Place it in a spray bottle and use to thaw ice in the locks of your car. Sugar is one of the best homemade de-icing solutions. Collect the sugary drinks that you have in your house such as soda or juice. Pour them into a spray bottle ready to thaw the ice on your car locks. Have a narrow spray bottle that will shoot the mixture directly into the locks. Also, have a cloth ready so that you can wipe off any of the liquid that will flow back as its colors and sugar concentration may affect your car’s paint and body works. Nobody likes to have their locks frozen. It is a major inconvenience that affects the mind and the body due to the freezing cold, that’s gnawing at you as you thaw the ice from your locks. Fortunately, there are numerous cheap and easily available solutions to gaining access into your car when its doors are frozen shut. Plus, you save money making de-icing sprays within a couple of minutes rather than taking an Uber to work. Or worse, having to tow your car to an auto repair shop. Homemade de-icing solutions are cheap and easily made. Make use of them for fast deicing of your car locks.